It’s Thursday Night and it’s sat somewhere in Sailsbury waiting to get going after everyone has stopped slowing down to look at Stone henge. My bus is due into London for 10pm and I’m scheduled to get to my friend’s house for 11pm. I have a full day of work the next day, so why am I putting myself through a weekend of tiredness and exhaustion? 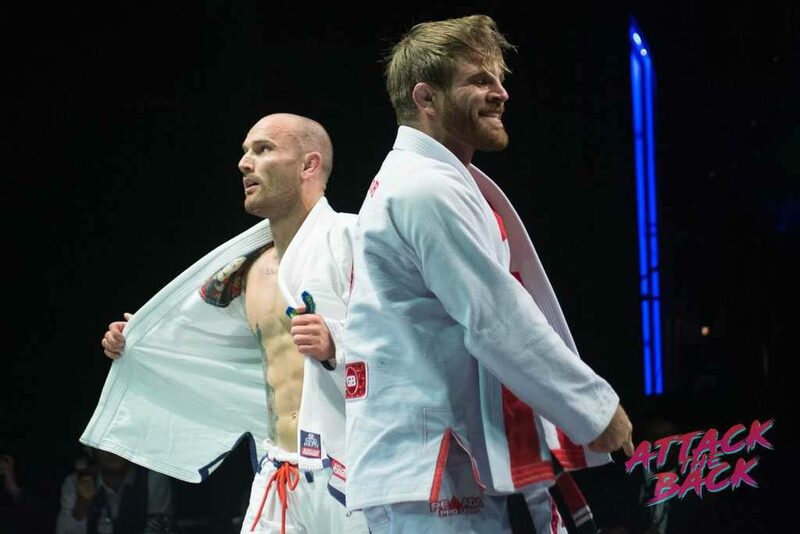 Polaris Professional Jiu-Jitsu Invitational has a new home, The indigo at o2 London. My alarm goes off and it’s 5:45am, really who wakes at this ungodly hour? I pour myself a cup of tea to try and wake up, and get my camera gear, my laptop and get ready for the hour journey to the weigh-in venue. I arrive at 7:45am and the weigh in’s don’t even start until 4pm, why am I here so early you ask? Besides from being a blogger, I also have a 9 to 5 that needs to get done. I setup in the hotel lobby near the coffee machine and sneak a couple of cups of coffee, while getting my head down. During the day I chat with the organisers, Matt and Ben from Scramble, and Gareth and Lee from Tatami Fightwear. These encounters are much easier than last time, since they gratefully invited me to cover Polaris 4 in their old venue in Dorset. During my morning I catch the eye of a few fighters, it’s very obvious to see who is here for Polaris and who isn’t, I think it’s the ears that give it away… I spot Caol Uno and message my friend in glee while I spot Shinya Aoki sitting with him, my friend reply’s “get a picture of him heel hooking you, also he sound’s like a robot, it’s amazing”, and it was amazing. I spot a few other fighters, have a good chat with Lloyd Cooper about his fight. Mid afternoon and I decide to relocate myself, there’s only so much of my own company I can take and I decide to finish the rest of my work off surrounded by a few of the guys working for Polaris, AJ Agazarm, Garry Tonon, & Jake Shields. A surreal moment for a fanboy like me. After being called out by AJ for my prediction article and a few conversations about the price of gas, we move onto Garry’s trolling of Dillon. If you kept up with it you would have noticed from amazing trolls coming from the DDS team making fun of Dillon’s recent Instagram persona and his buddy Conor McGregor. Garry wants a full sleeve tattoo to imitate his rival, but he can’t figure out to do it, eventually he settles on the idea of a henna tattoo and he sets about calling London salons. Garry’s first attempt didn’t go well, after finding out they apparently don’t do henna tattoo’s, it later transpired that they would not do a henna tattoo on him because he’s male, while most British people would have brushed this off, Garry begins a verbal onslaught that’s as good as his submission game, calling them discriminatory, asking to speak to the manager, among various other things. Finally Garry finds a salon that will do his henna tattoo and off he goes. It’s 3pm and i’m finishing off my work and I get chatting to Miha, who is fighting on the undercard against River, we share pleasantries , chat about work and chat about the upcoming fight. There’s a buzz of excitement as everyone filters into the weigh in room. The room is tiny and barely has a enough room for the fighters and their coaches, not including everyone else. After Polaris 4, I decided to place myself firmly front row and centre, I’m determined to come out of this event with good pictures, after last year’s didn’t shape up to how I wanted to to be. Get get my seat next to a man and his dog, this turns out to be Brad “One Punch” Pickett. We chat, exchange pleasantries about how training was going, chat about the upcoming match and his dog Bonnie. Which, by the way, is maybe one of the cutest dog’s I have ever met. The undercard starts their weigh in and everything goes according to plan, everyone is on weight and all the weigh ins get done nice and quickly, apart from River not turning up because he was stuck in traffic due to a crash. The Main Card Weigh ins get underway, some key moments of the weigh ins are Samantha Cook’s struggle to make weight and the fact that Jake Shields’ made Daniel Strauss look small. The final weigh in is announced and Dillon Danis walks in, headphones on, ready for battle. He makes weight and awaits Garry, who arrives with big Dollar sunglasses and henna tattoos adorned. The weigh ins are done and everyone disperses, apart from Lloyd Cooper, who’s opponent, AJ Agazarm, hasn’t shown up. People theorise about why he’s not here but it’s because he’s stuck in traffic after going for a little London sight seeing tour. After months of social media bashing, the 2nd most anticipated weigh in, ends in solo weigh ins for each competitor. The evening draws and and I’m sat in the lobby editing my pictures, I see the Polaris guys get ready to go out for some food and beers at the O2, I politely decline as I have plans to meet some friends that evening. The picture’s get uploaded and I get ready for the long day ahead. It’s 12pm and after a restless morning I grab my gear and decide to go for a coffee before heading to the o2. At the coffee shop I get my thoughts together, think through ideas and plans for the day, finish up my coffee and head to the venue. 45 minutes late I arrive at the future home of Polaris. Looking up at the o2 it’s amazing to see how far this sport has gone. From a half full venue in Cardiff to a sold out show in London, that’s twice the capacity, it’s a testament to the hard work the team have put in to producing the best show they possible can. And tonight’s card reflects their hard work coming to fruition. I walk into the Indigo at o2 and see the final bits of preparation going into tonight’s sold out show. I like to get to the venue early so I can claim my spot matside and get everything together ready for the evening. VIPs trickle in, door staff mill around and fans are eagerly awaiting outside to meet their heroes. The doors open and people excitedly start to filter in, out back everything is looking on point, the undercard are warming up, the staff are getting their final run down and I get ready with my gear to shoot the undercard. It’s time for Polaris 5 to begin. The undercard gets underway to a half-full room, I not sure why people don’t turn up for the undercard, because they are some of the most exciting matches. The night gets underway with Ffion Eira Davies facing off against Elvira Karppinen. The match is an exciting back and forth, with Ffion dominating the fight with his dynamic guard passing and her unique CF24 jiu-jitsu system. Ffiona firmly secures the back and has a few attempts at a strangle and Elvira repays in kind with some dangerous foot locks. The match ends with a judge’s decision in favour of Ffion. 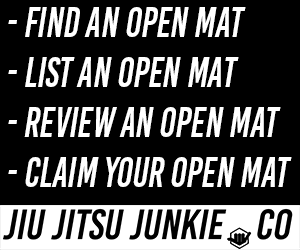 An exciting start to what hopes to be one of the biggest nights in Jiu-Jitsu. The next fight comes in the form of Miha Perhavec against local favourite River Dillon. River walks out first, beating his cheat and pumping himself up, Miha walks out a stone-cold killer. The match starts out of with a bit of head wrestling with River jumping guard. When River’s guard opens Miha quickly jumps into a savage heel hook, River defends but the match ends with an unfortunate and severe injury to River’s knee. Miha’s roaring celebration quickly turns to worry as he watches opponent being stretched off the stage. We wish River all the best and hope’s he is fit and competing soon. The event continues with with Tomas Simola against 10th Planet London’s head coach Jamie Scott. The match is an excellent display of guard passing and retention, with Tomas regularly using the knee slide pass to get past Jamie’s legs only for Jamie’s unconventional 10th planet techniques regaining guard. The match finishes with Jamie looking for a choke but ultimately the judges favour Tomas Simola. The last fight on the undercard sees the Polaris veteran Masakazu Imanari fight Valmyr Neto. The match goes the way everyone thinks is would go, Imanari starts on the floor and see him entangle his legs with Neto’s, eventually finishing the match with a heel hook. It’s a satisfying win for a legend that hasn’t seen much success on the Polaris stage. The undercard finishes with everyone’s mind on the heel hook that shook the venue and people start to look towards the main event. The Venue’s getting noisy and Tone Anderson, our announcer for the night, gets the party started with the ceremonial fighter walk on. The excitement for the night ahead is palatable, especially when the final two fighters, Garry Tonon & Dillon Danis, are announced. The fighters file off the stage and the first bout begins. The first match features Gracie Barra black belt Bradley Hill facing off against Tommi Pulkkanen aka Spaghetti BJJ. The featured a heavily 50/50 and leg lock orientated match and everyone found out why Tommi’s nickname is Spaghetti, with a novel footlock defence by grabbing his own foot. In the end Bradley sneaks out a Judges decision due to his constant work and submission attempts. Next comes two of the UK’s top female black belts, Samantha Cook and Vanessa English. 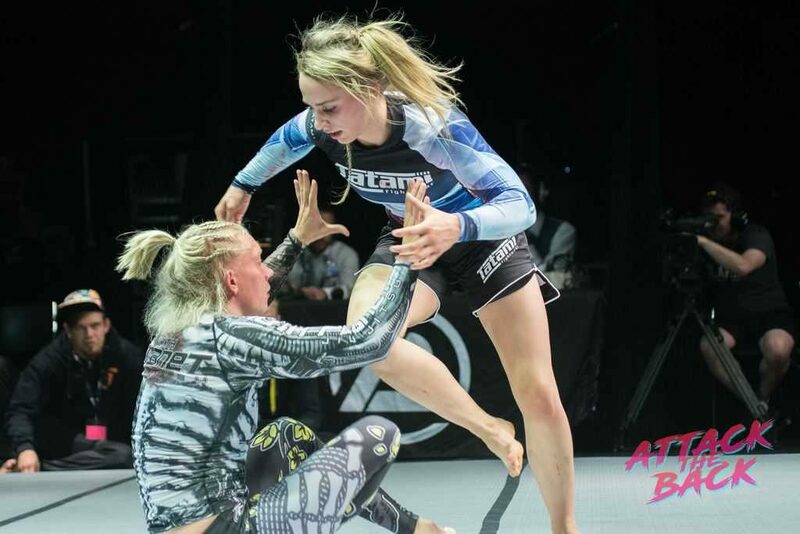 Samantha, the naturally heavier fighter used her weight to her advantage with some heavy pressure passing, while Vanessa used her natural flexibility to retain guard and attack footlocks. Sadly Vanessa’s hard work was not enough for the Judges and Samantha Cook wins by Judge’s Decision. The third match of the night features a bit of excitement in the air. Whispers start going around the stage the Roger Gracie is here to coach Ross Nichols. I, myself have a fan boy moment as Roger and Braulio sat next to me to coach their fighter. The Match between Ross Nichols and Oliver Taza was my favourite of the night. This match was a rematch of their fight at the Tuff Invitational, where Taza snuck out an inside heel hook in the later minutes. The match is frantic and both fighters attack with dangerous submissions and positions. 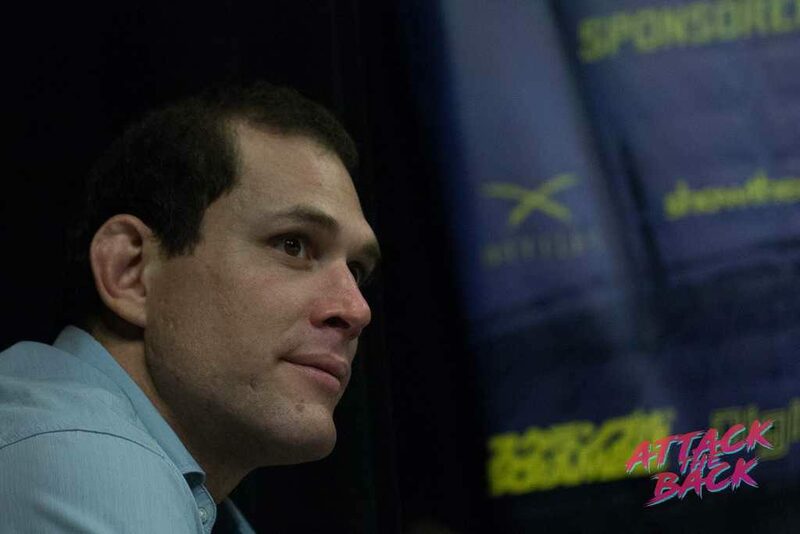 The match is also a battle of two of the best head coaches in the world, Roger Gracie and John Danaher. However, John Danaher’s coaching team featured a rather unusual figure, Mauricio Gomes, Roger’s father. After the 15 minute mark there was no submission between the two, and the winner is announced as Oliver Taza. The final fighter before the intermission features the first of our two heated battles, The King of the North, Lloyd Cooper, and The Florida Boy, AJ Agazarm. AJ uses his wrestling to get the match to the ground quickly and work his lapel guard until he eventually reaches Lloyds back, where he finishes the match via Bow & Arrow Choke. AJ Agazarm announces himself as the new King of England, while being drowned out by boos from the crowd and a flaying rubber foot from an obvious Lloyd Cooper supporter. With the first four fights through and the event fully up and running, the team take a quick half an hour to refuel with sushi and energy drinks. I myself head to the Press Room to transfer files ready for the final part of the show. The 5 minute call rings and everyone scuttles back onto the stage to conclude the event. Part two of Polaris starts off with a bang with two legendary fighters Caol Uno and Vitor ‘Shaolin’ Ribeiro facing off. These two fighters have fought on previous occasions in MMA and their respect for each other was obvious. The match begins with Shaolin sitting to guard and performing a technical sweep to a scramble, eventually ending up on Uno’s back. However, tap is not in Coal Uno’s vocabulary, where he fall unconscious to Shaolin’s short choke. Round six sees two UFC veterans Phil Harris and Brad ‘One Punch’ Pickett square off on the Polaris stage. The match is an unusual affair where a large portion of the match is spent with Pickett inside Harris’ closed guard. The most exciting part comes from Pickett and Harris almost falling off the side of the stage. The match is won by Phil Harris on a split decision. The Co-Main Event of the evening features Danaher Death Squad, Scrap Pack and ex UFC fighter Jake Shields facing off against local hero ‘The Raspberry Ape’ Daniel Strauss. The match was a slow burner with Shield’s shutting down Strauss’ butterfly guard, with Strauss’ having the lion share of submission attempts. However, it was Jake Shield’s that the Judge’s favour due to the high amount of take downs. The Final Match and eagerly-anticipated rematch between Dillon Danis and Garry Tonon doesn’t fail to impress. Garry regularly attacked Dillon with a Marcelo Garcia arm drag to low single and Ashi Garami attempts while Danis looked for Tonon’s back. 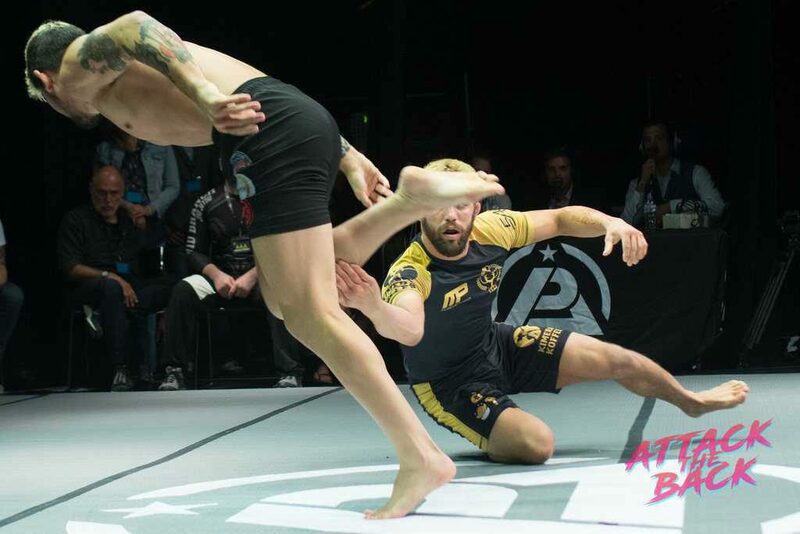 The match is awarded to Garry Tonon due to his constant pace pushing and aggressive submission attempts. 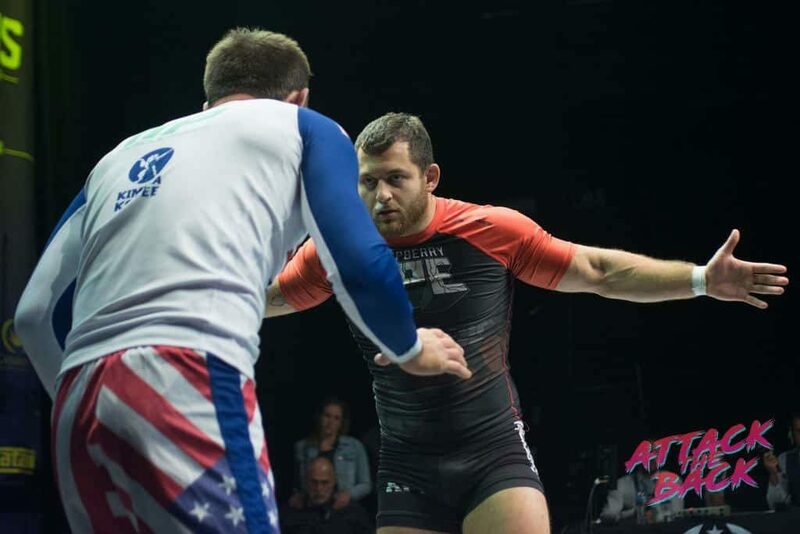 Overall Polaris 5 was their first event in London and was a massive success. Overall there were few complaints about the stream and there was nothing but good things to be said about the night. I finish up my night with a few beers in the Purple Lounge with the VIP’s, fighters and staff and finish my night off with a cheeky selfie with Roger and Braulio. It looks like Polaris has found it’s new home. Roll on Polaris 6.